According to this story in the Chicago Tribune, the Great Lakes Naval Station is celebrating its 100th birthday this year. All I can say is, something's wrong with the math. I spent 100 years there in 1974 alone. So far, in my quest to shame members of the Navy Musicians Association who are engaging in unauthorized musical performances between reunions, I've outed Rabbit Simmons and Bob Marquart. Their actions are, of course, disgraceful, but at least I can distance myself from their scandalous behavior. But now I've uncovered evidence of another NMA gigger, and can't so easily disassociate myself. You see, bassist Max Murray and I were shipmates in Newport and at the School of Music. 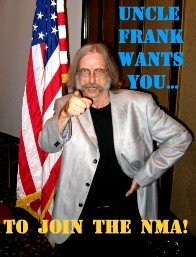 A couple of years ago, I thought it would be great to see him again, so I helped recruit him into joining the NMA. Apparently, our annual reunions are not enough for Max. Here's the footage; like Simmons and Marquart, he's been moonlighting between reunions. Not with an obscure trio or no-name cocktail duo. No, leave it to Max Murray to perform regularly as a member of the Grammy-winning Afro Bop Alliance. Max Murray, have you no shame? Another NMA member caught gigging. I recently posted about the shocking discovery that certain members of the Navy Musicians Association are actually performing in public during the 51 weeks of the year between reunions. I have vowed to "out" those members who practice, perform or lead ensembles. Now, it is my sad duty to inform you that I've caught NMA member Bob Marquart in the act of performing in, of all places, New Orleans. I could understand it if he were gigging in East Peoria or downtown Moose Crossing, Idaho, somewhere where his scandalous behavior would go unnoticed. But no, Marquart has the effrontery to do it in front of the cameras in Jazz City, USA. For years, Bobby was one of the most active on-call trumpet and banjo players in Virginia Beach. I guess he thought this background, combined with his talent, would open doors for him in New Orleans. And I guess he was right.